Email bungle: MP Greg Warren is calling for an extension of time for public submissions on Appin Road improvements. 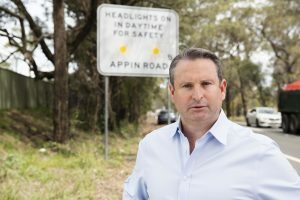 Campbelltown MP Greg Warren has called on the state government to extend the public submission period related to future works on Appin Road after a brochure calling for feedback featured an invalid email address. The brochure called on the community to make a submission regarding the Review of Environmental Factors (REF) on Appin Road. However, constituents’ emails bounced back when they sent a submission off to the email printed on the brochure. Mr Warren said if the state government genuinely wanted the community’s feedback, the submission date of Friday, December 14, 2018, had to be extended. “I suspect the amount of money this Liberal state government has wasted on glossy brochures could have paid for the construction of Appin Road’s dual carriageway already,’’ he said. “Roads Minister Melinda Pavey can’t even ensure correct email addresses are printed on a brochure so how can she be trusted to provide the long overdue safety improvements on Appin Road? “The answer is simple – she can’t. The Campbelltown MP pointed out that it was well documented there has been a large number of fatalities and serious crashes on Appin Road in the past 20 years. So there was no question improvements were urgently needed to make the road safer for motorists. “But there have also been far too many deaths of native animals so any works need to be performed with the utmost consideration and respect for the environment,’’ Mr Warren said. “The state government’s own glossy brochure states that there were eight koala fatalities on the road in the first six months of 2018. “The last thing those koalas need is for their vital habitat to be bulldozed as a result of poor planning.